Northern Ontario covers 90% of the actual land mass of Ontario, but only holds 6% of its population. Sparse and natural, the area is known for its outdoors activities and rugged inhabitants. Distances are large in Northern Ontario as going from North Bay to the Manitoba border is 1600kms (1000 miles). There are several small francophone communities in Northern Ontario, however English speaking travellers shouldn't encounter any issues with language since most of those living in these communities are bilingual (English-French). There are also many communities that speak mainly Cree, however this is usually on reserves and, once again, there are usually English speakers as well. Air Canada Jazz  provides daily service from Pearson International Airport (IATA:YYZ) to North Bay, Sudbury, Sault Ste Marie, Timmins and Thunder Bay from Toronto (Thunder Bay also served from Winnipeg, Manitoba). Westjet  flies to Thunder Bay from Toronto. Bearskin Airlines  (based in Thunder Bay) provides services to various smaller communities in Northern Ontario, including Red Lake, Dryden, Sioux Lookout and Kenora from Winnipeg, Manitoba. Porter Airlines  flies to Thunder Bay, Sudbury and Sault Ste. Marie from Toronto City Island Airport (IATA:YTZ). The 2 main routes through Northern Ontario are Highways 11 and 17. Hwy. 11 begins its northwest journey from Hwy. 400 just north of Barrie while Hwy. 17 begins at the western end of Hwy. 417 just west of Ottawa. The highways meet in North Bay, then diverge 4 km away with Hwy. 11 going north towards Timmins and Cochrane, and Hwy. 17 going west to Sudbury and Sault Ste Marie. They rejoin at Nipigon and stay concurrent towards Thunder Bay. They diverge once again west of Thunder Bay with Hwy. 11 ending at Rainy River, Ontario / Baudette, Minnesota border while Hwy. 17 continues through Dryden and Kenora and to the Manitoba border. The distance by vehicle from North Bay to the Manitoba border on Hwy. 17 is approximately 1650kms (1050mi). Greyhound  provides service to Northern Ontario from Toronto and Winnipeg, Manitoba along highways #11 and #17. Ontario Northland  coach service routes are from Toronto to Hearst, Ontario along the Hwy #11 corridor as well as Hwy #69 and #144 to Sudbury and Timmins. Caribou Coach based in Thunder Bay, services from Hearst to Fort Frances. Caribou Coach also operates along routes formerly operated by Excel Bus Lines, from Fort France to Kenora and from Kenora along Highway 105 to the communities of Red Lake and Ear Falls. Car rental services are available in most of the larger centres. Including Kenora, Red Lake, Thunder Bay, Nipigon, Terrace Bay, Marathon, Sault Ste. Marie, Sudbury, Timmins, and North Bay. 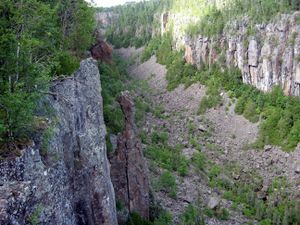 Camping: Northern Ontario has a lot of provincial parks , some for day use only and others that have camping facilities. 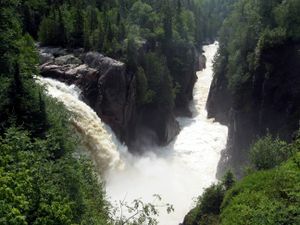 There are 3 large ones accessible by highways: Quetico Provincial Park ; Lake Superior Provincial Park  and Kakabeka Falls Provincial Park . There is one national park: Pukaskwa (pronounced puck-a-saw)  which offers day use and overnight facilities. No motorized boats are allowed to be used in the park except those that access the park from Lake Superior. Train Excursions: Ontario Northland operates an one day train tour called the Polar Bear Express. It departs Cochrane at 09:00am and arrives in Moosenee 5.5 hours later, returning to Cochrane arriving at 10:30pm. This train one of the few remaining in North America that lets you flag it down to get picked up. Algoma Central Railway operates the Agawa Canyon Tour train  departing from Sault Ste. Marie going north to Agawa Canyon and returning the same day. Watch out for black flies. To protect yourself wear long sleeve shirts (white or brightly colored), thick socks, and long pants (tuck the pants into the socks) and apply a covering of DEET. Also some type of bug netting in your tent is advised. Flies are most active at dawn and dusk. This page was last edited on 11 December 2015, at 15:32.